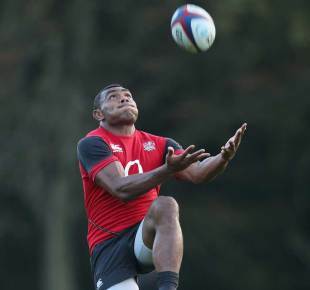 New England winger Semesa Rokoduguni is using his other life as a serving soldier as motivation for his imminent Test rugby career. Rokoduguni will win his first cap on the right wing when New Zealand open the Series at Twickenham on Saturday just two years after he turned professional with Bath. He is a serving soldier with the Royal Scots Dragoon Guards and was deployed in Afghanistan in 2011. It took only a week to experience the horrors of war when a marine on his patrol lost both legs after stepping on an improvised explosive device. "Every single time I join the camp, here or even at Bath, I always think about this stuff," he said. "When I think about that incident and how that marine soldier was badly injured, it gives me a boost to make the most of every opportunity because you don't know what's going to happen next. "It could be you. There could be a serious injury on the rugby field so you have to give everything that you have." Since his elevation into England's squad for the autumn series against New Zealand, South Africa, Samoa and Australia, Rokoduguni's new team-mates have been eager inquisitors over his experiences in Afghanistan. "They've been asking me questions about the Army and what it's like being out there," Rokoduguni said. "I told them it is pretty similar to what you guys feel - the only difference is that here there is always a next time. Next week you can come back stronger and better. "Out there in Afghanistan you have to be on top of your drills every single time because if you mess up that can cost someone their life." Rokoduguni's motivation against world champions New Zealand will extend beyond representing England and the British Army with pride. "I'll have pictures of my son Iiaitia and my family with me before the game," he said. "With that mentality I imagine all the family back at home watching me on the rugby field - if I'm not performing then I'll let them down. "This is on my mind - them watching the game and wanting to prove to the world and my family that I can do my best and be the best out there on the rugby field."